An incredible mix of gourmet nuts to tantalise your taste buds and satisfy your hunger. 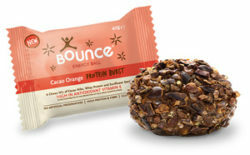 The Cashew & Peanut Ball has been developed to meet the requirements of those with specific dietary needs. They also provide a rich natural source of fibre, iron, magnesium, zinc, vitamin E and the antioxidant selenium. Pecan Nuts(11.6%), Peanuts, Cashew Nuts(9%), Brown Rice Starch, Grape Juice, Crispy Brown Rice (Brown Rice, Barley Malt), Oats, Oat Bran, Sesame Seeds, Sunflower Seeds, Raisins, Safflower Oil, Natural Vanilla, Natural Flavours (No MSG), Sea Salt, Mixed Tocopherals (Natural Vitamin E). For orders to Australia, please note that we cannot send nuts, seeds or any food items due to import regulations. 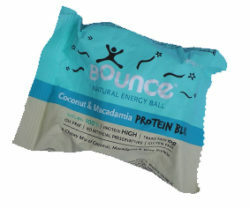 This includes items such as green mixes, Bounce Balls, etc.